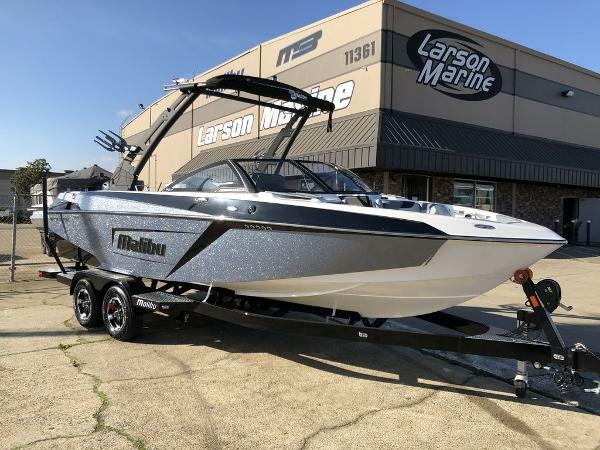 2019 Malibu Boats 23 LSV Clean and classic Zephyr Blue metallic and white 23 lsv! Wakesurf boat of the year and the best all around boat on water! THE BEST-SELLING TOWBOAT OF ALL TIME Legendary PERFORMANCE The best-selling towboat of all time, and for good reason. At 23 feet, it’s the perfect size to make memories on the water with up to 15 people. The 23 LSV will generate an absolute wall of water when you want it, but with the Diamond Multisport Hull it can create approachable wakes for beginners and even mellow slalom wakes. With a classic traditional bow look, the 23 LSV is the essence of the original Malibu brand and still a legend in the industry. Features may include: COMMAND CENTER & NEW HELM SEAT The Command Center is the smartest combination of digital interfaces and traditional controls in the industry. The bright, high-resolution 12-inch MaliView touchscreen gives you finger-tap control of the ballast, Power Wedge III and Surf Gate. New for 2019, our new helm seat with new plush fabrics and padding, gives you the ability to turn without rotating the seat. G3.5 TOWER The Malibu standard, the G3.5 is designed to raise and lower with one person while fully loaded with board racks and speakers. WAKEVIEW BACK-UP CAMERA This high-definition rear-view camera is located on the transom, so you can always keep an eye on what’s happening behind the boat for increased safety. Footage is viewable live on the MaliView screen. 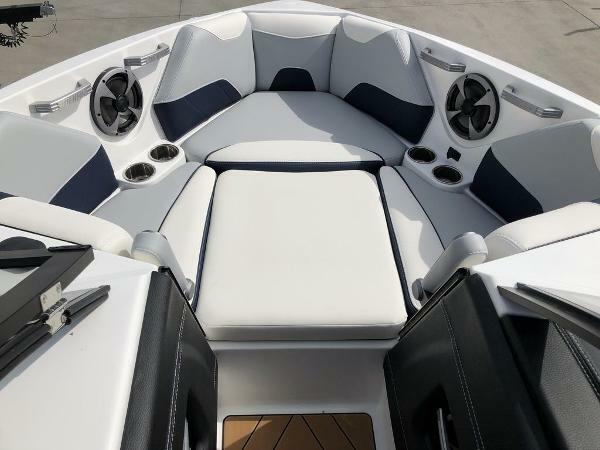 ALL-NEW PADDING & VINYL For 2019, Malibu has introduced new softer padding and vinyl making those long days on the water more enjoyable. 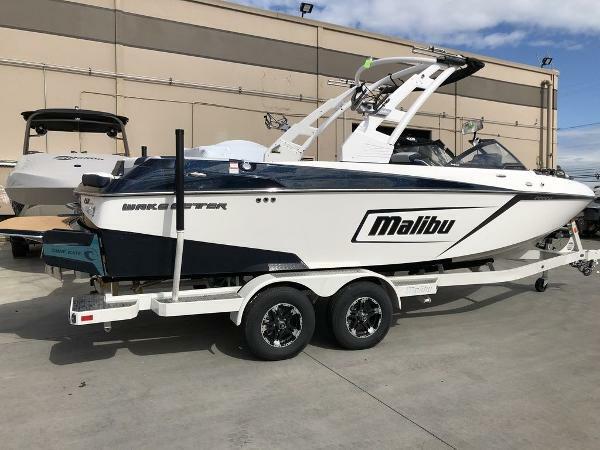 INTEGRATED SURF PLATFORM (ISP) Malibu’s exclusive ISP starts with Model-Specific Performance Hulls, Quad Hard Tank ballast, and Malibu's exclusive Power Wedge III and Surf Gate. Control it all with the touch of a finger using the Malibu Command Center and our exclusive Surf Band wrist remote. SPORT SPECIFIC HULL – DIAMOND OR WAKE PLUS HULL The Diamond Hull was created by reversing the chines, to create more lift at ski speeds. This design causes the rear of the hull to lift out of the water more, creating a flatter, softer ski wake. The Wake Plus Hull which allows the boat to sit deeper in the water at slower speeds for more water displacement. GORILLA FINS We use gorilla fins with 120 square inches of surface area; not only is the size important but the fin placement on our models is further forward than others. This fin maximizes tracking ability, handling and control. THE MALIBU 23 LSV DOMINATES ON THE WATER, AND IN THE MARKET. 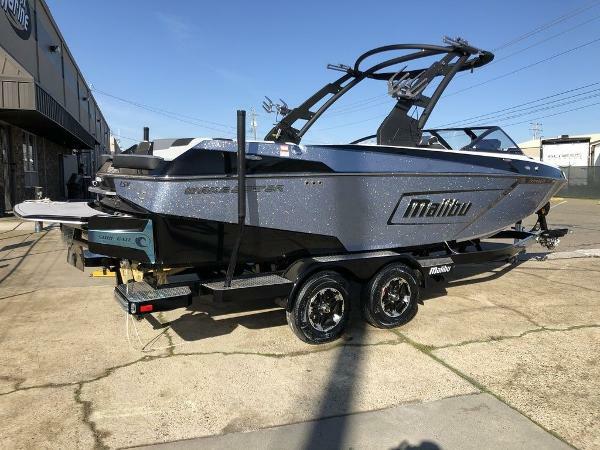 2019 Malibu Boats 23 LSV Stunning graphite and metallic 23 lsv! Loaded up and ready to go! THE BEST-SELLING TOWBOAT OF ALL TIME Legendary PERFORMANCE The best-selling towboat of all time, and for good reason. At 23 feet, it’s the perfect size to make memories on the water with up to 15 people. The 23 LSV will generate an absolute wall of water when you want it, but with the Diamond Multisport Hull it can create approachable wakes for beginners and even mellow slalom wakes. With a classic traditional bow look, the 23 LSV is the essence of the original Malibu brand and still a legend in the industry. Features may include: COMMAND CENTER & NEW HELM SEAT The Command Center is the smartest combination of digital interfaces and traditional controls in the industry. The bright, high-resolution 12-inch MaliView touchscreen gives you finger-tap control of the ballast, Power Wedge III and Surf Gate. New for 2019, our new helm seat with new plush fabrics and padding, gives you the ability to turn without rotating the seat. G3.5 TOWER The Malibu standard, the G3.5 is designed to raise and lower with one person while fully loaded with board racks and speakers. WAKEVIEW BACK-UP CAMERA This high-definition rear-view camera is located on the transom, so you can always keep an eye on what’s happening behind the boat for increased safety. Footage is viewable live on the MaliView screen. ALL-NEW PADDING & VINYL For 2019, Malibu has introduced new softer padding and vinyl making those long days on the water more enjoyable. 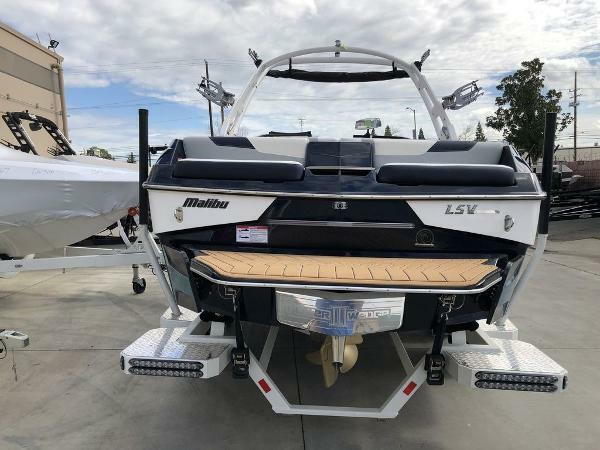 INTEGRATED SURF PLATFORM (ISP) Malibu’s exclusive ISP starts with Model-Specific Performance Hulls, Quad Hard Tank ballast, and Malibu's exclusive Power Wedge III and Surf Gate. Control it all with the touch of a finger using the Malibu Command Center and our exclusive Surf Band wrist remote. SPORT SPECIFIC HULL – DIAMOND OR WAKE PLUS HULL The Diamond Hull was created by reversing the chines, to create more lift at ski speeds. This design causes the rear of the hull to lift out of the water more, creating a flatter, softer ski wake. The Wake Plus Hull which allows the boat to sit deeper in the water at slower speeds for more water displacement. GORILLA FINS We use gorilla fins with 120 square inches of surface area; not only is the size important but the fin placement on our models is further forward than others. This fin maximizes tracking ability, handling and control. 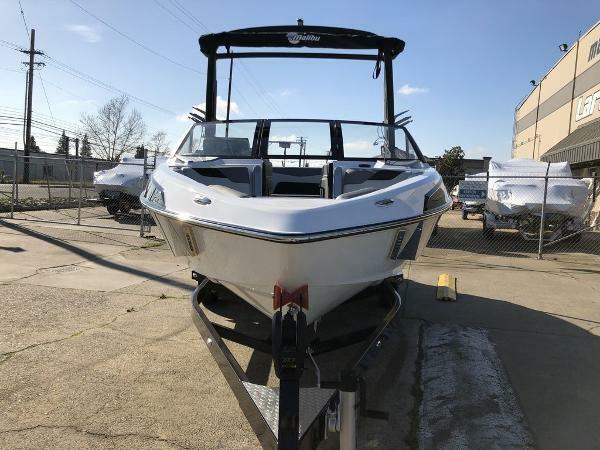 THE MALIBU 23 LSV DOMINATES ON THE WATER, AND IN THE MARKET.